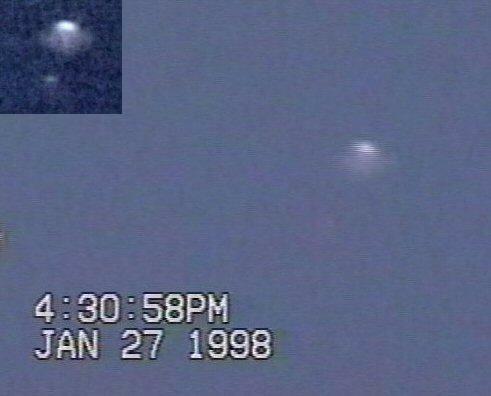 Video was Taken on Jan. 27th 1998 at Around 4:30 PM. The video shows the smaller object more than once and quite visible several times. It also includes a pan back showing an airplane pass underneath the object to show reference between the two. NIDS Analysis Report on video-- "Inconclusive"
It too, becomes part of their research data. Clearly a disk shaped object, daylight footage - This is a WOW Video - very interesting ! "The Rose Park Video is Spectacular! - We were all Impressed"
WEIRD TV CHUCK CIRINO who licensed the footage for their second episode "UFOS"